Hailing the recent peace agreement signed by 15 warring parties in the Central African Republic (CAR), the UN Children's Fund (UNICEF) stressed on Monday that "now is the time for action" and outlined concrete steps that armed groups, judicial authorities and the Government can take so the future of millions of children can be safeguarded. "The peace agreement signed by the Government of the Central African Republic and other parties to the conflict is a welcome step towards lasting peace and the hope of a better future for the country's children," said UNICEF Executive Director Henrietta Fore in a statement. "We particularly welcome commitments to protect children's rights and put an end to grave violations against children, but commitments are not enough. Now is the time for action," she added, regretting that "for too long, violence, instability and chronic underdevelopment have devastated children's lives in the Central African Republic". the Government to adopt as soon as possible the Child Protection Code and to align the country's juvenile justice system with international standards. 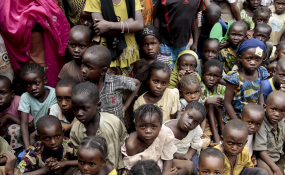 Since conflict began in CAR in 2012, due to fighting between the mostly Christian anti-Balaka militia and the mainly Muslim Séléka rebel coalition, thousands of civilians have been killed and two out of three people became dependent on humanitarian aid. Children have been particularly affected, according to the UN children's agency: one in four is displaced within the landlocked country or in neighbouring countries, and millions remain out-of-school, malnourished and vulnerable to disease, abuse and exploitation. Peace talks started on 24 January this year and an agreement was reached 10 days later under the auspices of the African Initiative for Peace and Reconciliation in CAR, led by the African Union (AU), with the UN's support. The deal was formally signed on 6 February. "UNICEF stands ready to support national efforts to help children affected by the conflict and is hopeful that this agreement will be a fundamental step towards long-lasting peace for the country's children," said Ms. Fore.